Lightning 100 took over stewardship of this mile long section of Mill Creek in 2013 and we've been taking care of it ever since! We'll be removing general litter from the creek and surrounding area, working to keep one of Nashville's Greenways in great condition. No experience necessary! All work is supervised by a Project Leader, and all equipment and materials are provided. 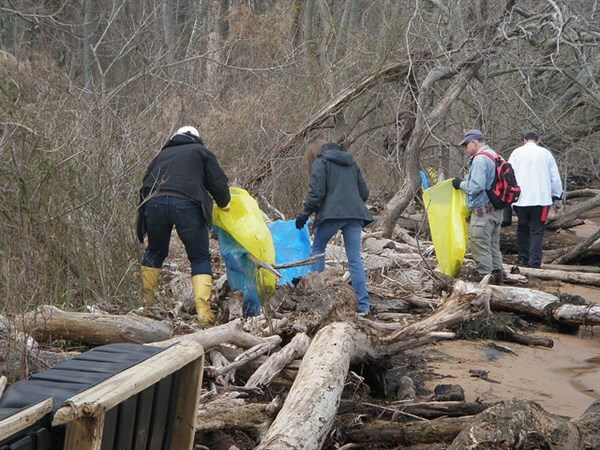 Volunteers will work together to walk the stream collecting trash and debris. Volunteers should wear work clothes that can get dirty. Closed-toed shoes or durable sandals are required. Work boots, hiking boots, rain boots or old sneakers are great. No flip flops! All you need is a love of nature and a desire to make a difference. Help us keep Nashville's waterways beautiful! Registration: Registration is REQUIRED for this event so that we can get an accurate headcount. Thank you! Kids Policy: This is volunteer experience open to all ages. Bring out the family to teach them about stewardship of our natural environment! Weather Policy: This is a drizzle or shine event. In case of severe inclement weather, the volunteering experience will be rescheduled. Pets Policy: Pets are not permitted at this event. We don't want any paws getting injured on sharp ojects or trash! Group Limit: This volunteer experience is limited to 15 people. If registering for more than 1 person, please provide contact info for everyone attending.